93Pts - WS - Vivid dark red fruit leads this Merlot/Malbec blend of Series M. The aromas are immediate, fresh, bright pure and expressive, including freshly picked dark cherries and black raspberries. Vivid dark red fruit leads this Merlot/Malbec blend of Series M. The aromas are immediate, fresh, bright pure and expressive, including freshly picked dark cherries and black raspberries. Undertones of citrus flowers, lightly perfumed are present. On the palate, the brightness of the wine expresses with a flavor display of the fresh Spring fruits, with refined texture. The finish is firm and long, a balance of fruit and fine tannins, an underlying structure that does not assert itself but gives the wine weight and longevity. Harvest started slightly later than average on February 18th 2014. The weather stayed consistently moderate for the harvest period. Grape bloom and veraison were short, which facilitated evenness in ripening throughout the vineyard. The Merlot blocks in particular were surpassing expectation resulting in the series M 2014 showing great color and concentration. a further 12 months in bottle. Vilafonté is the first American and South African joint wine-making venture. This groundbreaking red wine project is a partnership between a respected group of winespecialists from South Africa (Michael Ratcliffe) and the United States (Zelma Long and Phillip Freese). Vilafonté is the first winery in South Africa to focus on making wine aimed specifically at the US market. 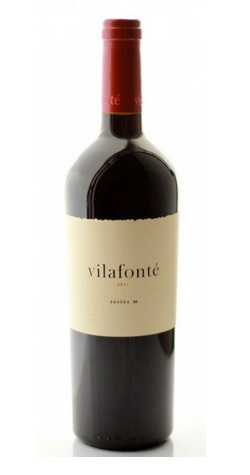 The name Vilafonté is derived from the primary soil type of the 100-acre estate, whose character forms the foundation of the wines. The Vilafonté project aims to create the first luxury wine brand from South Africa.